Kim had an abridged form of this letter published in yesterday’s Independent. It’s a response to the case of Debbie Purdy, the British MS sufferer who has just won a landmark decision in the Law Lords; they’ve told the Director of Public Prosecutions to clarify how his department decides to prosecute in cases of those who expedite assisted suicides abroad. 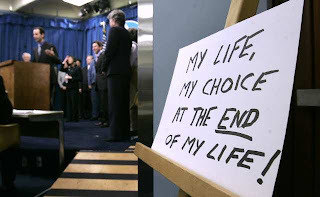 As a result of the ruling, pressure will inevitably mount for assisted suicide to be legalised in the UK. On the subject of assisted suicide, let’s bracket the theology. Atheists will only sneer, not altogether unreasonably – Christianity has form on dogmatism – even though their own claim to ethical neutrality and objectivity is itself not only hopelessly doctrinaire but downright delusional, for there is no view from nowhere. Let’s bracket too Richard Ingram’s observation (opinion, 1 August), though it’s literally right on the money, about the tempting market advantages of assisted suicide in a late capitalist economy of alleged scarcity, not to mention in a culture of youth, health and beauty. For the sake of argument, we can even bracket the idea – perish the thought – that the relatives and friends of the ill and aged might pressure them into an early self-dug grave. But what cannot pass unchallenged is this notion of personal autonomy, as if my own desires and wishes were not themselves largely socially determined. I am who I am only in relation to others, and the view I have of myself turns largely on how others view me. If society as a whole no longer believes and affirms – unconditionally – the value of my life, if the signal it sends (not least in legislation) is that, ultimately, I am expendable, then I too will believe myself expendable. In short, “I choose to die” may look like an assertion of freedom when in fact it is the cry of a person in chains: the chains of choice itself.